-WE HAVE TEMPORARILY CLOSED OUR WEBSITE. ALL OF OUR PRODUCTS ARE AVAILABLE FOR PURCHASE FROM OUR ETSY SHOP AT CHARCOALDESIGNS.ETSY.COM. -OUR PRODUCTS ARE STILL AVAILABLE FOR WHOLESALE TO OUR WHOLESALE CUSTOMERS. 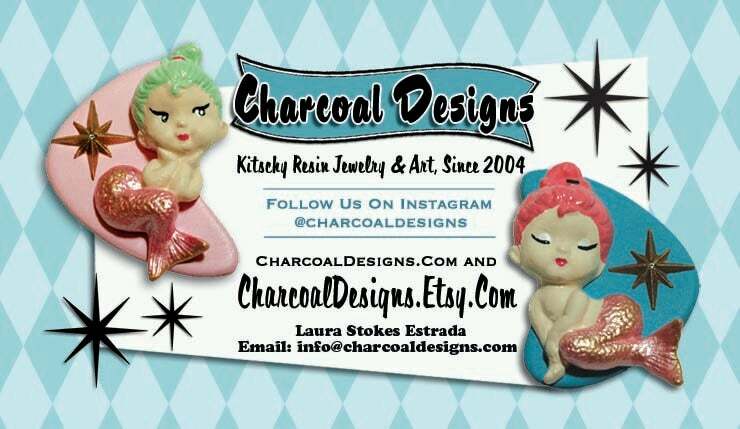 IF YOU CAN'T FIND WHAT YOU ARE LOOKING FOR HERE PLEASE EMAIL LAURA AT INFO[AT]CHARCOALDESIGNS[DOT]COM. Charcoal Designs' products are lovingly made in the Los Angeles area by designer Laura Stokes Estrada. Each resin piece is hand cast and dyed in our studio, and hand assembled. Attention to detail is key in the process of making each piece something to be cherished for years to come by it's new owner, you! 1.) Who is Charcoal Designs? Charcoal 'Coal' is our black cat. Charcoal Designs features hand cast resin jewelry, reminiscent of vintage bakelite, in fun kitschy retro styles. Some creepy, some cute, but always unique. 2.) What sets your product apart from the crowd? Everything from start to finished is designed and handmade in-house. From designing our website and header cards to pouring and dyeing the resin. No more than two people (my husband and I) make every product you see. I always pay special attention to detail and never let anything go out before it passes the 'I would wear it myself' test. Nothing ever gets thrown out, even our cast off pieces are re-purposed for art assemblages and some donated to local schools for student projects. 3.) A brief history...how Charcoal Designs got it's start back in 2004. Oddly enough I got my start selling on consignment websites like 'Cut + Paste' making hand embroidered iPod cozies. One was even featured in Lucky magazine in 2005, which was a huge honor because it is one of my all time favorite magazines. Although I had some success with designing iPod cozies, I started transitioning from embroidery to using vintage components in jewelry making and then decided that once I started filling wholesale orders that I couldn't keep making one of a kind pieces (and still make a profit or keep customers satisfied) so I taught myself mold making and resin casting, I could now make any color or quantities that I desired. For the last 5 years my focus has been on hand cast resin jewelry and art full time but still dabble in embroidery for fun. 4.) Any words of wisdom for aspiring designers? Learn when to sway and when to stand your ground. Remember who you are designing for, your preferred market, but also be willing to adapt and change when necessary. Stay open minded. Anything is possible when you are your own boss. It's your business take charge!